Most of the attractor flies I fish are dry flies—big dry flies. And they've really saved a lot of fishing days for me. 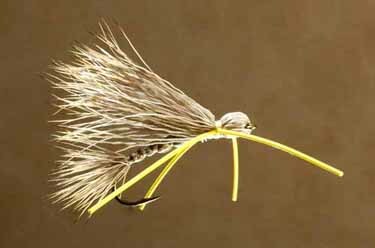 I recall my first time out on Silver Creek in Idaho when that morning I hooked several good fish on size-24 imitations of midge pupae fished dead drift just a few inches down. But later, when neither the tiny midges nor any other flies would move a fish, I took my best trout of the day on one of the big attractor dry flies— a Mikulak Sedge—twitched boldly across the current. And I savor the memory of the slab-thick cutthroat trout up in eastern British Columbia, Canada that would only occasionally take a nymph nearly bounced off their noses, would only once in a while rise lazily to conventional dry flies, yet would race up to a big Chernobyl Ant—a sort of outlandishly big dry fly ant imitation with too many too-thick legs. 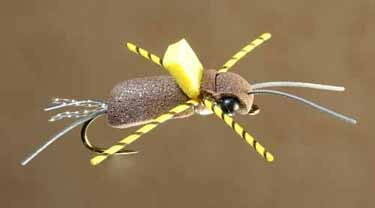 The Chernobyl Ant has probably opened the minds of more imitation-only purists than any other attractor dry fly over the past couple of decades. When the Ant works, it can work wonders. When it works and then stops working, I usually switch to a sort of outlandishly big, brown beetle of my own design: the Morrisfoam Predator. The Predator was designed as a buoyant imitation dragonfly nymph, meant to hover just above lake-bed snags when retrieved on a full-sinking line. But it caught on as a full-fledged dry fly soon after it went out on the market—and for good reason, I later proved to myself. So now I often switch back and forth between these two ridiculous big foam flies. None of this makes sense, of course; it just works. Other big Attractor dries that are usually fished dead drift include the Stimulator, the Turck Tarantula, and the Trude series. And there are many others. Most often, big attractor dry flies are fished dead drift. Some, like the Madam X, another big attractor with a loyal following, are fished either dead drift or with twitches. 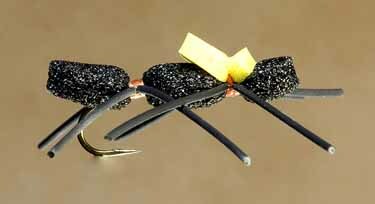 The Madam X is a hair fly with long yellow rubber-strand legs and a whole lot of deer or elk hair. Those unnaturally long legs not only insure that the fly won't resemble anything a trout might ever have seen before, they also quiver with nervous life at every shift of the current. Like I mentioned with the Madam X, not all big attractor dry flies are best fished dead-drift. One of my ace-in-the-hole patterns is the Mikulak Sedge— a long-shank dry-fly hook beneath a tail and several short, spaced, clumps of elk hair for a wing, a single hackle for a collar. I seldom let it ride the current undisturbed. Jerk it across the surface of the water. Rest it briefly and then start working it again. This apparent huge, winged insect foundering on the surface, struggling to escape, seems to turn some pretty jaded trout. The Mikulak Sedge is, technically, an imitative fly. It is generally tied big and with a green body to imitate the enormous "traveling sedge", a caddisfly of lakes. I sometimes tie it big with an orange body for the October caddis of western streams. But often as not, I just throw out a size-8 or even -6 Mikulak— of any body-color—and then skid and twitch it back at times when nothing is hatching and the trout haven't seen a giant caddis in weeks or months— if ever. Since I'm therefore fishing an imitative fly, yet imitating nothing, as far as I'm concerned the Mikulak Sedge then becomes an attractor fly. 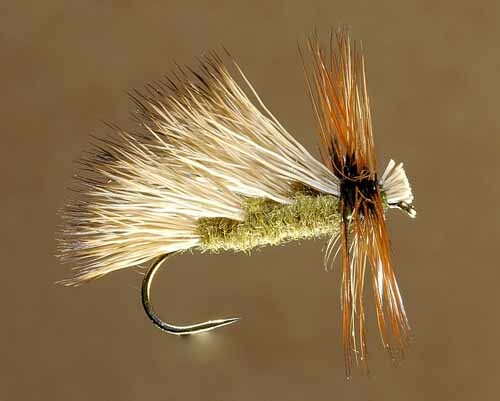 A lot of big dry flies are like this—imitative by design but often productive as attractors. 1. To begin with, your tippet should probably be stout—at least 4X—to keep the fly from spinning and twisting it up. 2. You may also find that a little more force in the cast is required to help push these big puffballs out to the fish. 3. A heavier line and rod than usual, a six weight or even seven, can help deliver out-sized flies, but with fair skill, and perhaps a bit of practice, you should be able to get big attractors out with a five- or even four-weight line. When to turn to the big attractor dry flies? I suppose they are a possibility almost any time. But I normally think of them when there is no significant hatch of insects distracting the trout. the trout are dour and unresponsive. But often enough, it does. And when it does, it can work wonders.